5905 ft (1800 m) . 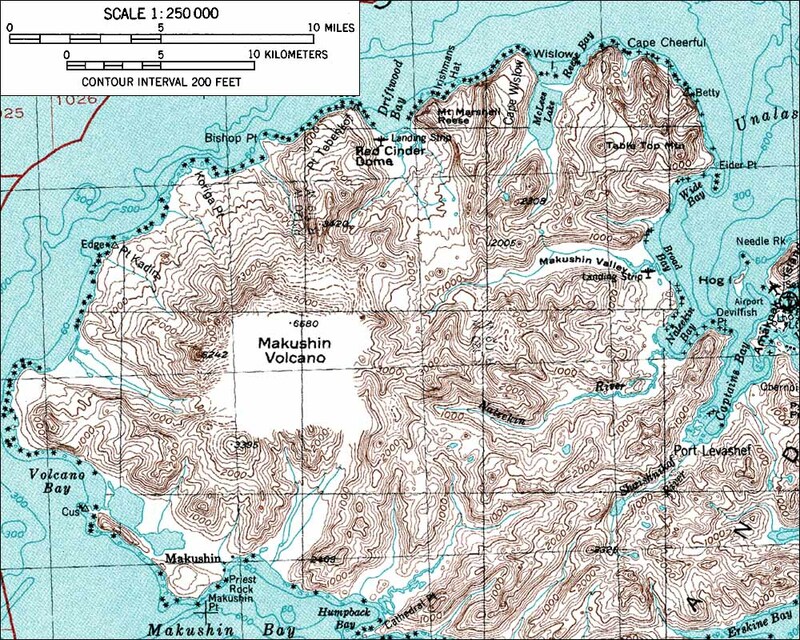 Makushin is a broad dome-like stratovolcano in the northern part of Unalaska Island in the eastern Aleutians. 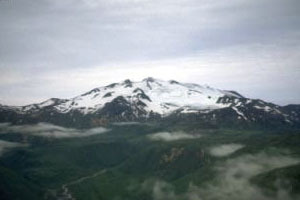 The upper portions of the volcano are largely ice-covered, and the summit is capped by a 1.5 mile (2.5 km) wide caldera, with an active cinder cone within it. Unalaska is the second largest of the Aleutian Islands, and it is home to the city of Dutch Harbor (also called Unalaska) located in a fine embayment on its northern coast. Dutch Harbor is served by regular commercial air service, and since it is only 15 miles (25 km) east of Makushin, access to the volcano is excellent by Aleutian standards. 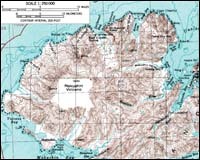 Note that the correct summit elevation for Makushin of 5905 ft (1800 m) is given only on the 1:63,360 scale USGS map Unalaska C-3 dated 1989, which does not have the nasty blank area shown on the 1:250,000 scale map below.